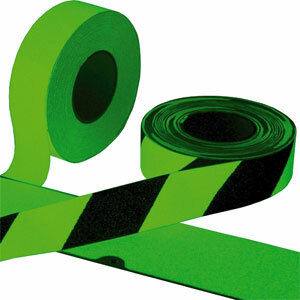 Dual purpose tapes prevent slips trips and falls and also highlight hazards in low light conditions.Tapes appear white in normal light conditions and glow brightly when light sources are removed.Suitable for indoor and outdoor use. Aluminium oxide non-slip surface is bonded to a high quality plastic carrier.Apply primer to porous floors prior to application to ensure proper adhesion.Edge sealer prevents premature lifting and improves longevity. Available in 3 widths, all rolls measure 18.3m long. Available in Plain or Black Chevron varieties.